Home » Your Extension Story! Please tell us about your connection to UW-Extension! Are you a Volunteer? Community Partner? Program Participant? Observer? More them one? Something else? What do you value about UW-Extension? 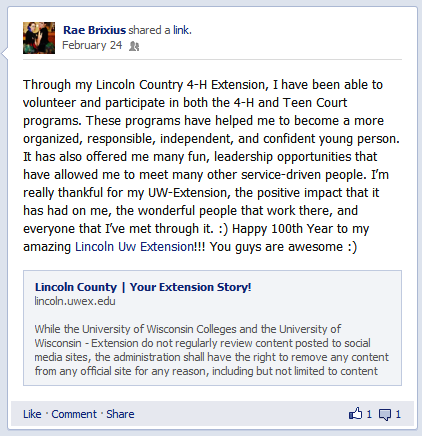 How has UW-Extension impacted your life? family? community? organization? Do you have some history to share? UW-Extension values your thoughts ideas and stories! Please share with us! 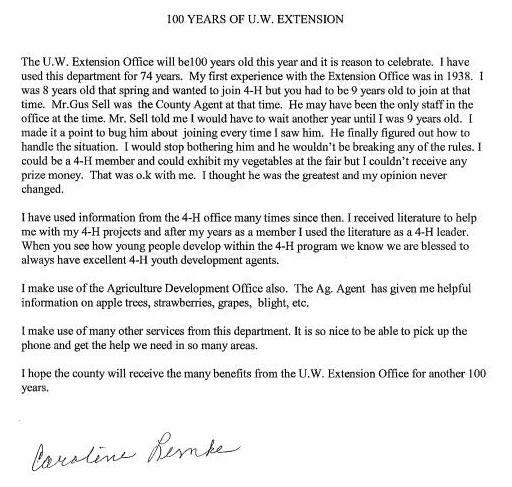 UW Extension is a fantastic resource in our county. The Aging and Disability Resource Center of Central Wisconsin started in Lincoln County in 2011. UW Extension has provided insight into the county and helped us set up prevention programs. They also rolled out Strong Women which has been a smashing success in Tomahawk and Merrill. We have been able to refer women to the program so they could participate in a quality, evidence based program. The Nutrition education has been wonderful at our Farmer’s Market Distribution Days and at our Nutrition Programs throughout the counties. They do so much more than I have space to write! Thank you for being an excellent partner and bringing so much to our communities! There are so many ways that I have partnered with UW-Extension I just couldn’t imagine accomplishing things without them! UW-Extension helped me professionally by its involvement in Leadership Lincoln County. I was part of the first Strategic Planning process that the Merrill police Department participated in. It wouldn’t have happened without their help. Serving on the HAVEN Board we also went through strategic planning with UW-Extensions’s guidance and facilitation. Many of the volunteer organziations and coalitions I am serving on or have served on used UW-Extension’s participation in planning, facilitating or implementing many important events and functions.